Twitter can be a strange, magical platform, where headlines are often made at the drop of a post. But it’s not all bad. 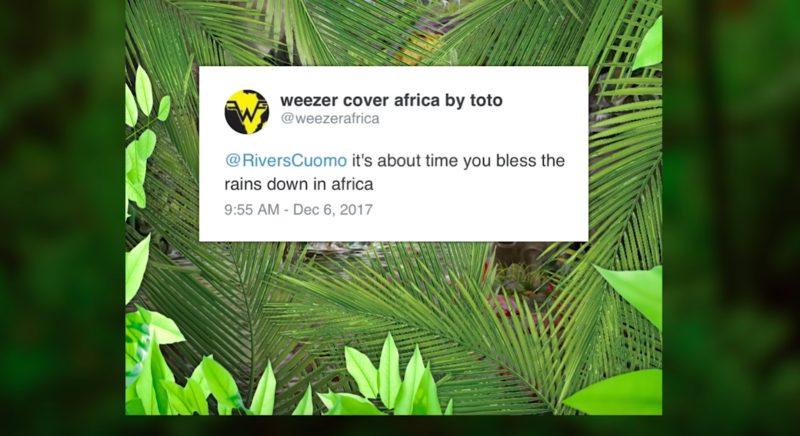 In fact, the band Weezer covered “Africa” by Toto — and it’s actually all thanks to Twitter. You see, once upon a time in December 2017, the account @WeezerAfrica popped up on Twitter. It was created by a teenage fan with the sole purpose of convincing the band Weezer to cover the song “Africa” by Toto. Humanity’s love of the 1982 Toto hit has become the best kind of meme. It’s an uplifting song, and everyone enjoys it. That’s the whole joke! In an era where irony reigns supreme, our genuine reaction to “Africa” is almost too pure for words. So when the @WeezerAfrica account — which has fewer than 2,000 followers, even today — first emerged, it seemed like a charming novelty. A song scientifically proven of inspiring catharsis in its listener, originally performed by an iconically ’80s band, covered by ’90s faves Weezer. Who wouldn’t want that? For months, @WeezerAfrica tweeted out its request to the band. It also occasionally engaged with its followers, asking what fans might do in the event that it actually happened. On Tuesday, May 29th, Weezer’s cover of “Africa” went live on Spotify. And friends — it is delightful. It’s true to the song, and true to Weezer’s alt sound as well. It is the chef’s kiss of song covers. In case you’re really falling down an “Africa”-inspired hole today, there are *plenty* of related things to keep you busy. There’s the version from Community that features Betty White and Donald Glover, for instance. Or the New Yorker long read that analyzes the ineffable emotion one feels when listening to “Africa” once it’s edited to sound like it’s playing in an abandoned mall. If you like your “Africa” even more abstract, a Twitter bot spits out lyrics from the song every so often. And of course, there’s the “how we spent our summer vacation” video made by Dax Shepard and Kristen Bell — set, magnificently, to the Toto classic. The lesson here? Commit to your Twitter bits, friends. You never know what might happen.